NORTHERN Tablelands MP Adam Marshall says a new public campaign calling for a full redevelopment of Moree District Hospital will arm him with more political muscle, bring the community together to show support and ultimately help make the strongest case possible to secure $80 million to get the job done. Mr Marshall was joined by Moree Plains Shire Mayor Katrina Humphries and around 50 locals yesterday at Moree Hospital to launch a petition that Mr Marshall hopes will demonstrate the community’s support for a new health campus. Mr Marshall launched the public petition and Mayor Humphries was the first person to sign it. “This is all about supporting the future of our town, we need to maintain health facilities and attract new ones,” Cr Humphries said. Mr Marshall said the public push would seriously add weight to the lobbying he’d already undertaken with Ministerial colleagues. “People power is a powerful and essential ingredient when it comes to political push on this scale,” Mr Marshall said. “When I mount a case on behalf of the community to the Health Minister and Treasurer to secure a new hospital, it makes an enormous difference to be able to show that everyone in Moree is right behind this project and the campaign for it. Mr Marshall said estimates put a full redevelopment cost at $80 million and while the existing hospital had wonderful staff and visiting specialists, the current hospital didn’t do justice to that professionalism and the environment health and medical practitioners and employees had to work in and with. “The current Moree hospital is past its use-by-date and while we’ve had significant capital expenditure in the last few years with $1.75 million to upgrade the operating theatres and $2 million for a renal dialysis unit which is being built and will be opened next month, the time for applying band aids is over,” Mr Marshall said. “We are trying to treat people with 21st century medical practice in conditions of a century ago. “The staff at Moree Hospital are some of the best in the health system and do a magnificent job, but they are working in a facility built in a very different time for a completely different model of health care and it needs to be replaced. Mr Marshall said the Moree community was entitled to the best health and patient care in a hospital built to modern standards and with an eye to demands in the next few decades. 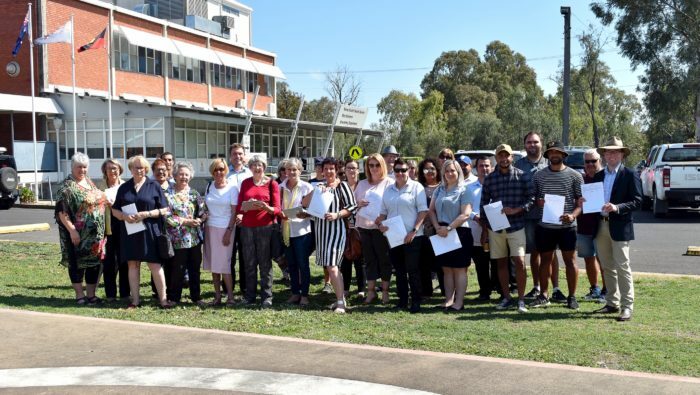 Northern Tablelands MP Adam Marshall and Moree Plains Shire Mayor Katrina Humphries with members of the local community brandishing petitions in front of Moree Hospital yesterday.